Originally posted in 2009, after I went on a weeklong book-signing tour in Michigan with several other authors from Barbour. While the computer equipment and office/house are different nine years later, pretty much all of this still holds true. On the book signing tour, we four spent quite a lot of time talking about how we write, where we write, and what writing tools and supplies we use. So I thought just for fun, I’d share some of my favorite writing tools/supplies with y’all. First and foremost, naturally, is my desk and my “big” computer. 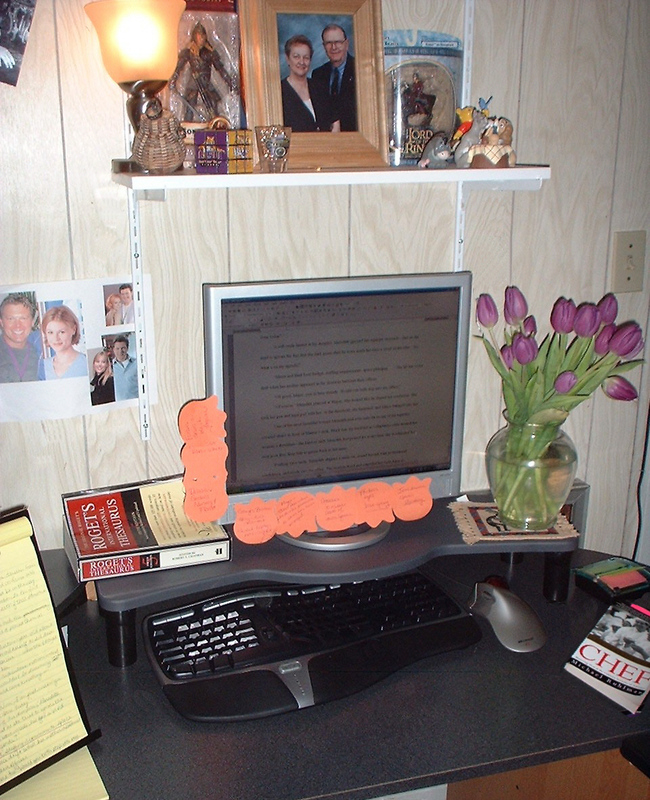 This is where I do most of my freelance editing work, some of my writing, and all of my revisions. And since there’s a hint of them in the (staged) photo above. . . 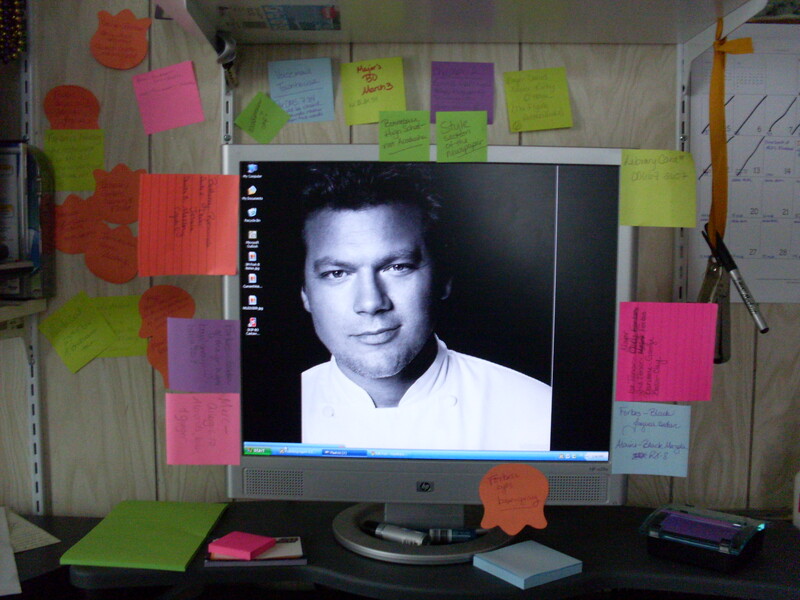 I can’t write without sticky notes! Every size, shape, color I can get my hands on. Including. . . Giant sticky notes (a.k.a. a Post-it brand flip chart). 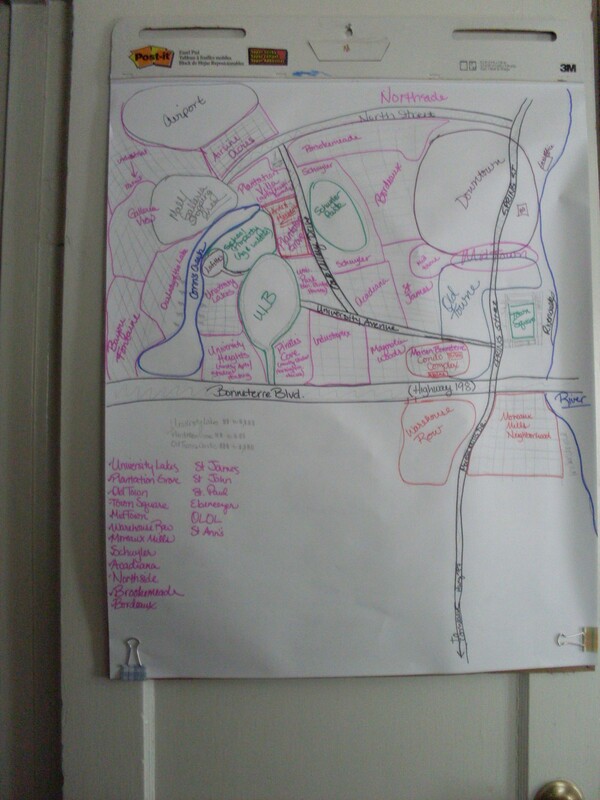 Yes, that’s a rough map of Bonneterre in the first picture! 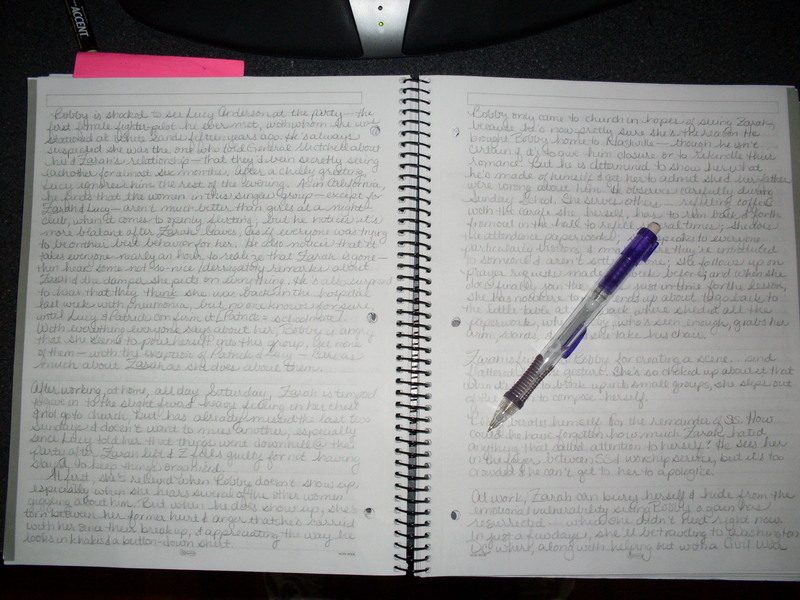 I may have mentioned here (but don’t specifically remember) that when I’m really needing to tap into my right brain and just let the words flow without unnecessary input from the left side of my brain (such as spelling, grammar, style, and structure), I write by hand. On the book tour, the girls had a good laugh at me whenever I would pull out my spiral notebook to get some writing done. . . I have a favorite mechanical pencil I use most of the time, since my favorite pens have a tendency to show through on the back side of the page, making it hard to read when I go back to type whatever I’ve written into the computer. Plus, I think there’s something that takes me back to childhood and that uninhibited creativity we all have as kids that comes from writing in pencil. Speaking of my favorite pens. 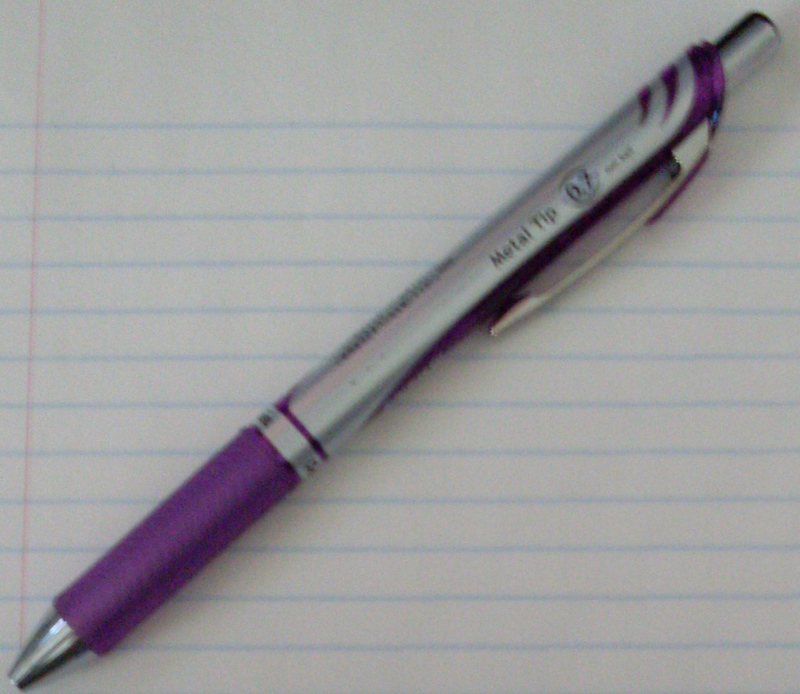 . .
It’s a Pentel EnerGel Liquid Ink Gel pen with a 0.7mm tip—and purple ink, naturally. I took several of these with me on the trip and always carry one or two of them with me in my purse. 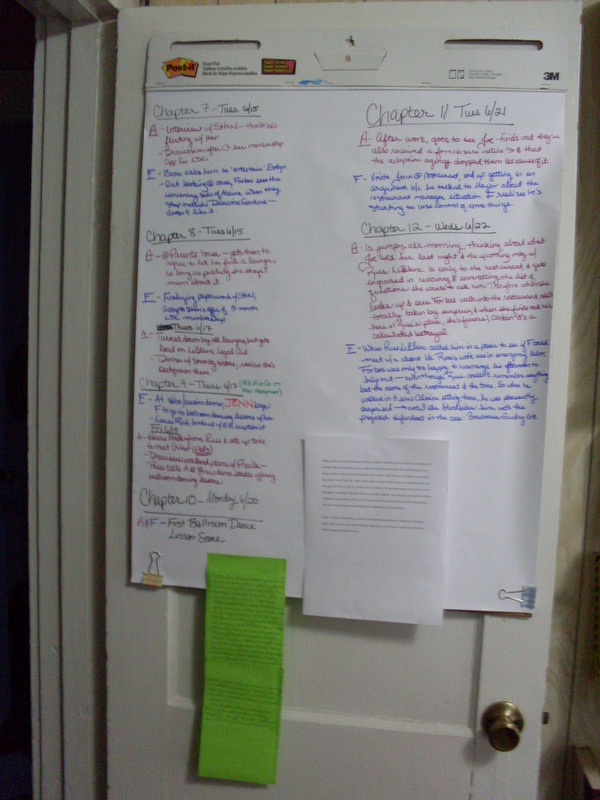 Now, because I don’t do all of my writing by hand, just occasionally when I need to get myself out of writer’s block or figure out where I’m going or work on a different story idea, I do have one place/tool which is where and on what I do most of my writing . . .
Because I’m a night person and because after dark is when I’m at my most creative/least distracted, sitting in bed with the laptop computer is when I’m most prolific at writing. And the lapdesk under the computer is one of the best investments I’ve ever made (picked it up at B&N—yes, probably would have paid less than $15 for it elsewhere, but it was purple and I couldn’t resist). So those are some of my favorite writing tools. What are yours? I don’t miss that 387-pound laptop at all . . . but I do miss that Trackball Explorer mouse. I had two—one for the desktop and one for the laptop. 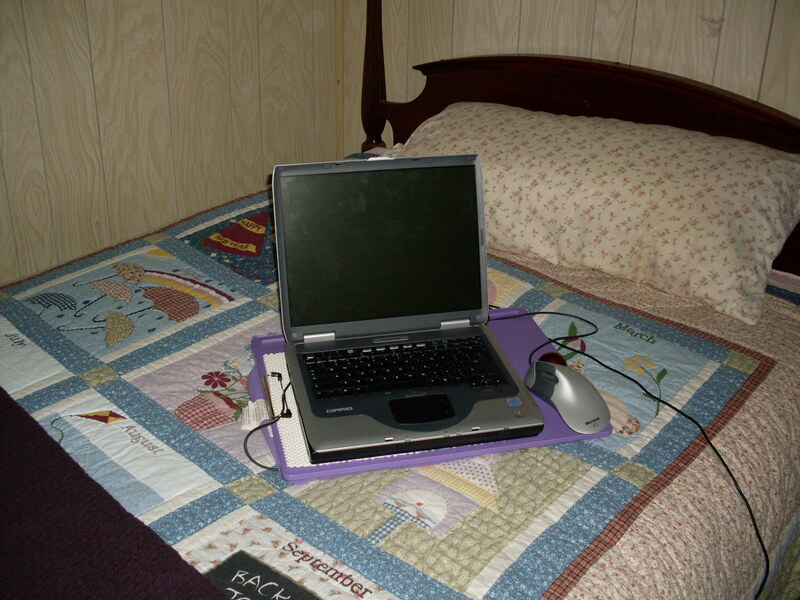 It sure made writing in bed a lot easier to have the trackball rather than a mouse (so I could keep the trackpad turned off, as those create a lot of issues for people like me who rest the heels of our hands when we type).